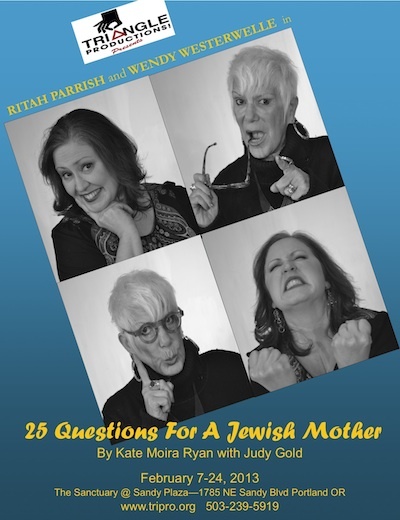 Only one week left to see Triangle Productions’s new staging of 25 Questions for a Jewish Mother, a funny funny play by lesbian comedian Judy Gold and her partner Kate Moira Ryan. While Gold performed the play as a one-woman show, inhabiting all of the characters, Triangle Productions has opened up the play and cast both Ritah Parrish and Wendy Westerwelle. As Judy, Parrish jokes about the challenges of being a Jewish lesbian mother having to deal with her own Jewish mother, played by Westerwelle, who also brings to life a grab bag of other great and funny characters in Gold’s life. Triangle Productions is Portland’s resident queer theater company, recently producing Avenue Q and A Joan Crawford Christmas. This entry was posted in arts, event, lesbian. Bookmark the permalink.